comprised of 400 youth advocates from more than 100 countries, the new class of 300 new Young Leaders will join the program early 2018. Young people between the ages of 15 and 28 from all countries are welcome to apply and you can access the application here. The application closes on 13 October, and the incoming class of Young Leaders will be selected and notified of their acceptance in December 2017. 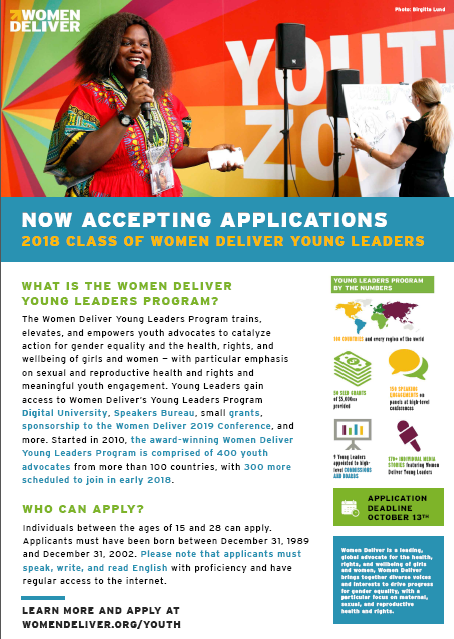 As advocates for girls’ and women’s health, rights, and wellbeing, we encourage you to apply and spread the word with fellow young people to apply as well. Want to learn more? Please read the Women Deliver Young Leaders Program – Promotional Toolkit and the Women Deliver Young Leaders Frequently Asked Questions.